Via Environmental Progress: A new, two-year investigation by Environmental Progress concludes that no American politician has killed more clean energy than Gov. 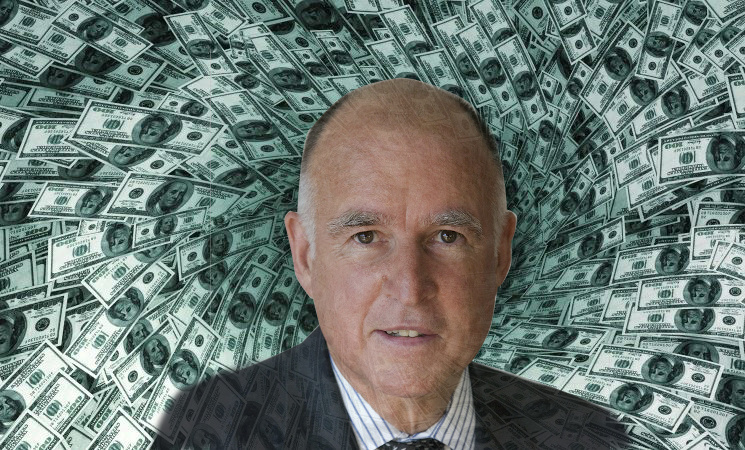 Jerry Brown — and in ways that often benefited his own family financially. We publish this story on the day the Brown-controlled California Public Utilities Commission has voted to kill Diablo Canyon, California’s largest single source of clean energy, and the state’s last nuclear plant. They did so despite being under federal and state criminal investigation relating to the closure of yet another nuclear plant, San Onofre, in 2013. Had Brown's policies resulted in lower emissions and cheaper energy, this would just be the story of yet another crooked political family. But they didn't: Brown's policies have increased California's carbon emissions and increased electricity prices. Since he was elected in 2010, California Gov. Jerry Brown has gained an international reputation as a climate leader. He has spoken at the Vatican, at U.N. climate talks, and promoted California’s policies in China. Journalists routinely praise Brown for reducing emissions by expanding clean energy. A new, two-year investigation by Environmental Progress concludes that no American politician has killed more clean energy than Gov. Jerry Brown — and in ways that often benefited his own family financially. Had Brown’s policies resulted in lower emissions and cheaper energy, this would just be the story of yet another crooked political family. But they didn’t: Brown’s policies have increased California’s carbon emissions and increased electricity prices. Between 2011 and 2016, Gov. Brown’s time in office, electricity prices rose nearly four times more (16.7 percent) in California than they did nationally (3.7 percent). What makes EP’s investigation even more significant is the crucial role Brown played in legitimizing anti-scientific anti-nuclear ideology, and creating the anti-nuclear movement — one which has replaced nuclear plants with fossil fuels (under the guise of renewable energy promotion) in Germany, Vermont, Japan, Taiwan, and other nations around the world. The story begins in the 1960s with the construction of Diablo Canyon. The goal of the state’s electric utilities was, at the time, to reduce dependence on coal, oil and natural gas, which were and remain expensive and dirty. On taking power in 1975, Brown and his allies aggressively wielded power in ways that directly benefited Brown’s family, which included killing nuclear power plants. We are not suggesting that financial motives alone explain the anti-nuclear movement. But the heavy and sustained involvement of Gov. Brown and others with a direct financial interest in killing the main competitor to petroleum and natural gas can no longer be ignored as a key factor to its rise and continuing power. In the early 1960s, an artist named Kathy Jackson started an effort to protect the Nipomo sand dunes near the central coast of California. Jackson’s strategy was to bring the state’s most powerful people to Nipomo so they could see their beauty for themselves. One of them was the President of the Sierra Club, Will Siri, a biophysicist from the University of California, Berkeley. Most of the dunes were undeveloped, but the economically depressed county of San Luis Obispo had zoned them industrial, and was actively seeking their development. But now Pacific Gas & Electric was considering building a nuclear power plant at the location. Siri was famous in conservation circles as a world-class mountaineer. In 1954, Siri led the first American climbing expedition to the Himalayas. They climbed Makalu, the fifth highest mountain in the world. In route, Siri saved a man’s life. He came upon a member of the climbing team of Sir Edmund Hillary. The year before Hillary made history by becoming the first man, along with his Nepalese Sherpa guide, Tenzing Norgay, to reach the summit of Everest. One of their men had fallen into a crevasse, and Siri rescued him. On his return from Makalu, Siri showed slides and gave lectures on his adventure to Sierra Club chapters up and down California state, becoming widely admired. Two years later, he was asked to join the Sierra Club’s board. During his 18 years on the Sierra Club board, Siri played a key role in transforming the Sierra Club from being a gentlemanly San Francisco-based hiking club to one of the country’s fiercest advocacy organizations. Under Siri’s leadership the Sierra Club won major victories to protect Mineral King — a stunning northern California valley that Walt Disney wanted to turn into a ski resort — ancient redwood forests, and the Grand Canyon. By 1966, Siri was helping Jackson get the Sierra Club Board of Directors to unanimously support saving Nipomo Dunes. Siri and Jackson met with PG&E, which by then had bought 1,100 acres of the best part of the dunes in order to build a nuclear plant. Siri and Jackson sought a compromise: PG&E, they said, could build the plant about a mile from the water. That turned out not to make sense economically, PG&E executives complained, since the plant needed closer access to the water. PG&E left and came back with a new proposal: it would build six reactors at a single plant on the coast. Doing so would allow for economies of scale, which had both an economic and conservationist logic. “If you were going to wreck a piece of coast, one unit will do it as well as two,” Siri explained later. “The object was to find a site where they could put multiple units.” Doing so would avoid the need for building more power plants along the coast. Will Siri and Kathy Jackson brought the swap of Diablo for Nipomo Dunes to the Sierra Club Board of Directors for consideration. They debated the matter for a day and half and then voted 9 – 1 to not oppose PG&E’s plans to build Diablo Canyon. The nuclear power plant would go forward with the tacit blessing of one of the most powerful organizations in California. It would be given the name granted the place by Spanish explorers: Diablo Canyon. In the 1950s and 1960s, American liberals and conservationists were mostly pro-nuclear, viewing it as a solution to poverty and pollution. But not all conservationists thought lifting people out of prosperity was a good thing. Some, influenced by the British economist Thomas Malthus, thought more prosperity would result in more people and more environmental destruction. In 1948, two influential books — William Vogt’s Road to Survival and Fairfield Osborn’s Our Plundered Planet — argued that a rising human population would create resource scarcity and environmental crisis. Osborn was the son of a eugenicist and “Aryan enthusiast,” while Vogt, a conservationist, would go on to become the national director of Planned Parenthood. Vogt worried about rampant breeding by world’s poor, particularly Indians. “Before the imposition of Pax Britannica, India had an estimated population of less than 100 million people,” Vogt wrote wistfully. Preventing catastrophe, Vogt argued, required hard limits on population and economic growth. The key was not the substitution of natural resources with synthetic ones, as modern prophets of progress proposed, but rather the sustainable use of renewable resources. In it he argued that humans were at risk of mindlessly treating the whole of nature as a standing reserve of resources for our consumption. These ideas were brought together by conservationists, including the Sierra Club’s Executive Director, David Brower, who reported to Will Siri. Brower was popular with members, but his troubles with the Sierra Club’s board of directors were growing. Brower was spending Club money, without authorization, on first class jet travel and luxury hotels in New York. What particularly upset the Board was when Brower secretly wrote into his contract a bonus for his publishing and editing work. As the Sierra Club board started to clamp down on Brower’s spending, he started attacking the Board’s decision to support the building of Diablo Canyon. Brower wasn’t opposed to nuclear for safety reasons but because it would provide cheap electricity for the masses: people he hoped to see excluded from California. While Siri and Brower were arguing about nuclear energy, California’s former Governor, Edmund “Pat” Brown, Gov. Jerry Brown’s father, started helping the Indonesian military dictatorship raise money to expand its state-owned oil industry. Pat Brown eventually raised an astonishing $13 billion ($100 billion in 2017 dollars) mostly from U.S. banks, the Sacramento Bee’s Dan Walters reported in 1990. In exchange for Brown’s services, the state Indonesian oil company Pertamina gave him exclusive and highly valuable rights to sell Indonesian oil in California. At the time, California burned significant quantities of oil for electricity production, not just for transportation. Between 1966 and 1974, the Sierra Club started to favor coal over nuclear, even though prominent nuclear advocates like Oak Ridge National Lab’s Alvin Weinberg were warning the world of the threat of global warming from continued coal use. And Gov. Brown appointed his friend and Getty Oil investment manager, Bill Newsom, to the State Superior Court. At the time, California’s electric utilities were proposing the building of nuclear plants as a way to reduce the state’s heavy reliance on oil and natural gas, whose prices had shot up in the early 1970s, after the OPEC oil embargo. And so, in 1976, Brown teamed up with the Sierra Club to kill them. On July 1, 1979, some 30,000 people assembled at an air strip in a remote part of the central California coast to hear Jackson Browne, Bonnie Raitt, Graham Nash other pop stars sing at a “No Nukes” concert. The appearance of California’s young governor, the 41 year-old Jerry Brown, pushed the concert to the front-pages of newspapers across the state. Concert organizers, the Abalone Alliance, were suspicious of the governor’s sincerity, questioned him for an hour, and privately deliberated before deciding to let him speak. One of the books that supposedly most influenced Brown and his allies was the 1973 Malthusian tract, Small Is Beautiful by E.F. Schumacher. The book argued that fossil fuels were finite and that humans thus needed to significantly reduce their energy and resource consumption. Even though the 1973 shortages were due to an OPEC oil embargo, and natural gas shortages were largely a consequence of price controls, the Malthusians persuaded many elites that energy was physically scarce. But on this point the Malthusians were slippery. “Even if we were to find a source of cheap, clean energy, we should be opposed because of what we might do with it,” said Amory Lovins, an advisor to both the Sierra Club and Gov. Jerry Brown. The Sierra Club’s new executive director was convinced, and advocated a fear-mongering campaign. Anti-nuclear groups introduced a ballot initiative that would effectively ban nuclear, and a close Brown ally introduced legislation to block new plants from being built until a waste repository had been created. Requiring a repository as a prerequisite for nuclear power would allow Brown’s anti-nuclear allies, Ralph Nader, Sierra Club, and Natural Resources Defense Council, to prevent the construction of nuclear power plants merely by then blocking the waste repository, as has now been the case for over forty years. When the state’s electric utilities came out against the bill, Gov. Brown threatened to campaign in favor of the more radical ballot initiative unless they backed down. The utilities caved in, and allowed the legislation to pass, and Brown signed it into law. One year later, San Diego Gas and Electric sought to build five nuclear plants in a project called “Sundesert,” which Brown attacked directly and through the agencies he controlled. Brown’s allies at the California Energy Commission (CEC) argued that future demand should instead be met by burning oil and coal. Brown’s California Air Resources Board (CARB) backed up CEC, concluding that “new fossil fuel power plants can be built in many parts of California without causing environmental damage,” and recommending the building of a coal plant. “The governor said, ‘I want the Department of Water Resources to build a coal plant,’” said Ron Robie, Director of the Department of Water Resources, a branch of the state Resources Agency. In 1979, Brown’s initially chilly reception by the “No Nukes” concert organizers made it seem like the governor was responding to the anti-nuclear movement. In reality, Brown had been quietly leading anti-nuclear efforts for years. Between 1976 and 1979, Brown and his allies killed so many nuclear power plants that, had they been built, California would today be generating almost all of its electricity from zero-pollution power plants. Flashback 2002: Jerry Brown says ‘it’s not viable’ for poverty-stricken developing world to emulate prosperity of U.S.